Wait Chapel neared its maximal occupancy on Feb. 5, a testament to the power of storytelling and the influence of the past on the present. 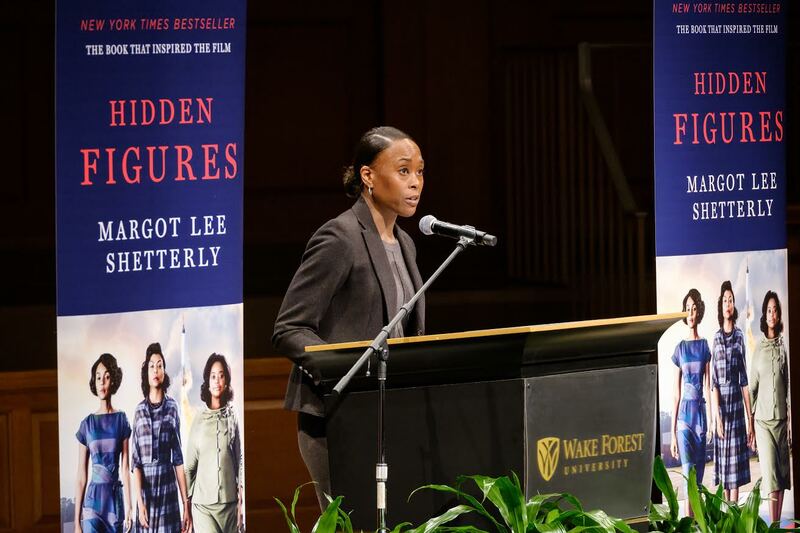 Margot Lee Shetterly, author of the New York Times bestseller Hidden Figures: The American Dream and the Untold Story of the Black Women Mathematicians Who Helped Win the Space Race, delivered a poignant keynote address to students, faculty and community members, regarding the nature of black history and its role in the American story. Shetterly began her speech with her own beginnings. The daughter of a NASA researcher and English teacher, she acknowledged that her upbringing made the frequently-neglected role of African Americans in science, technology, engineering and mathematics (STEM) fields a “matter of fact,” quipping that the first engineer she ever knew was black and the first black person she ever knew was an engineer. Shetterly also spoke of her upbringing in Hampton, VA, a community filled with NASA engineers, mathematicians and researchers. This community was permeated by the influence of the groundbreaking African Americans whose contribution to America’s success in World War II and the space race proved invaluable, according to Shetterly. These men and women, lacking the opportunity, respect and status of their white counterparts, made possible numerous groundbreaking technological feats and helped land Neil Armstrong on the moon. Why, then, Shetterly asked, is their story so overlooked? Shetterly posed several possible reasons. The black women who worked at the Langley Research Center for NASA were subjugated to “a land of marshes and mosquitos known as the West Area,” Shetterly said. Their seclusion in the woods behind Langley made them less visible, more apt to be forgotten. Additionally, they were hired as “sub-professionals,” Shetterly said, a title lesser in prestige and pay than their male counterparts, despite their equivalent workloads. Female specialists in calculating flight paths, aerodynamics and gust alleviation were rarely allowed in important meetings at Langley, despite the profound impacts of their work, Shetterly noted. Freshman Andy Killebrew found Shetterly’s speech both inspirational and of historical value by placing prolific black innovators in the context of an interconnected American story rather than relegating them to the confines of black history. “[Shetterly’s speech is] notable for the manner in which it challenged the very lens through which we examine history,” Killebrew said. Shetterly called on her readers to see firsts as beginnings, not ends; the successes of such female African American mathematicians as Katherine Johnson, Mary Jackson and Dorothy Vaughn, in Shetterly’s opinion, do not represent a final step in the pursuit of black excellence, but a beginning from which to progress, a legacy to not only uphold, but to further. Shetterly left the audience with questions for themselves to address: “What have you missed? What is it you know that the rest of us have missed?” She requested that we simply listen to stories and tell them, too. After a short question-and-answer session, spoken word poet and Wake Forest’s Program Manager of Pre-College Programs, Donovan Livingston, delivered a passionate performance of his most recent work, “Quasar” to conclude the evening. Livingston, whose 2016 Harvard graduation speech received viral attention, spoke lovingly of his black predecessors whose influence shaped American history and fiercely of the patriarchy and racial stigmas that preclude African Americans and women. Blending themes of adversity and triumph through references to the interstellar, Livingston equated the scientific, social, and political influence of the hidden figures to celestial bodies called quasars, which emit massive amounts of energy despite their remote seclusion in the vastness of the cosmos. The talk was affiliated with Project Wake: Exploring Difference and Embracing Diversity, and was sponsored by the Departments of Biology, Chemistry, Computer Science, Engineering, Math and Physics, the Office of the Dean of the College, the Division of Campus Life, the Intercultural Center, the Office of Personal and Career Development, the Provost Office, Wake Downtown and the Women’s Center.